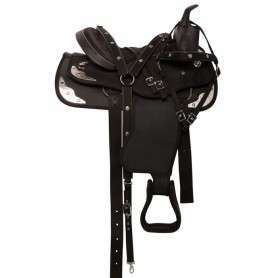 Perfectly balanced deep seated saddles with a high cantle and pommel to ensure stability around tight turns. 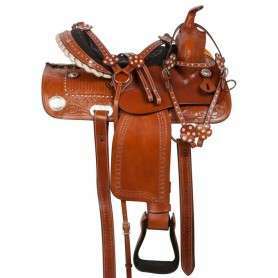 This natural premium tooled barrel racing horse western saddle features a rounded skirt that is perfect for shorter backed horse! 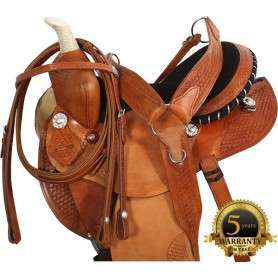 Comes with free matching headstall, reins, and breast collar while supplies last. On sale now for only $449.99 today! This gorgeous barrel racing saddle features a medium chestnut leather that is hand carved with floral and basket weave tooling and features a crystal accented trim that will really make you stand out in the arena! Now only $299.99 for a limited time! This western synthetic saddle is made from a black cordura material that makes it light weight and easy to clean! 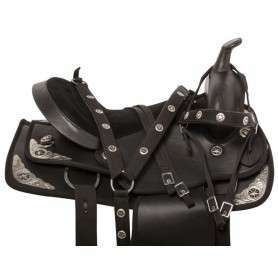 Perfect for trail riding, this saddle also has silver corner plates for extra bling. Only $199.99. This gorgeous barrel racing western horse saddle features crystal decorations and is accented with floral and basket weave tooling. 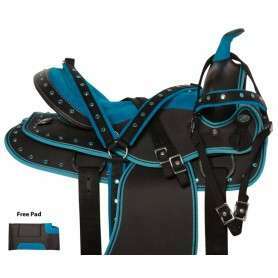 The seat is padded with black suede and the saddle comes complete with matching tack for only $299.99 today! 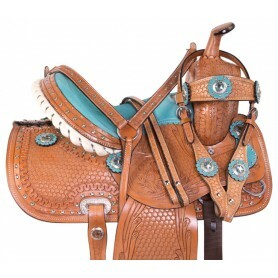 This adorable western horse saddle features turquoise accents and crystals on premium cowhide leather! Available in youth sizes 10" through 13" with matching headstall, reins, and breast collar for only $199.99 for a limited time only! 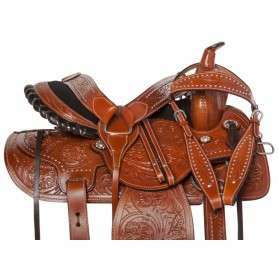 This beautiful western synthetic saddle features blue accents including crystal trim, conchos, and nylon binding that ensures the saddle stays tear proof! 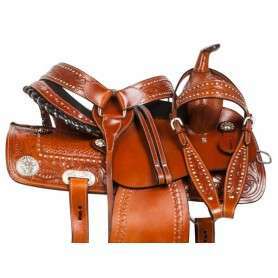 This saddle comes complete with matching tack and saddle pad for only $199.99 today! 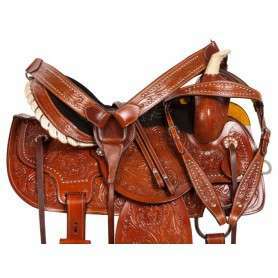 This beautiful western synthetic saddle features blue accents including crystal trim, conchos, and nylon binding that ensures the saddle stays tear proof! 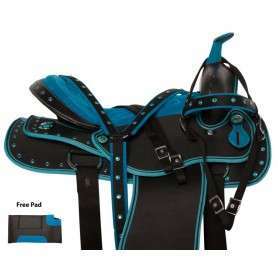 This saddle comes complete with matching tack and saddle pad while supplies last!